I quit modelling to give maximum time to my business.then slowly PCOD and extremely busy schedule due to my business Lead to a very unhealthy lifestyle and hence weight gain. 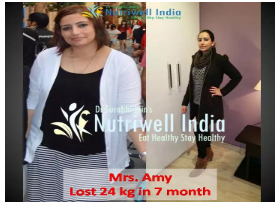 When I came to India and Searched for Weight loss services I came across Nutriwell. When I called them they sound very convincing. Now I am very happy as I reduced 20 kg in just six months and I am still following their plan.I am sure that I will be back to my model figure soon.